I will be inside the church hall sharing a site with the lovely Amanda from Easy Peasy Organic. If you are not familiar with Amanda’s blog or her work, she’s an amazing vegetarian mom with a passion for organic food, beauty, education and photography. You can check out a post she has written about the markets here — while you are there be sure to browse around her site for great inspiration and recipes (yum!). 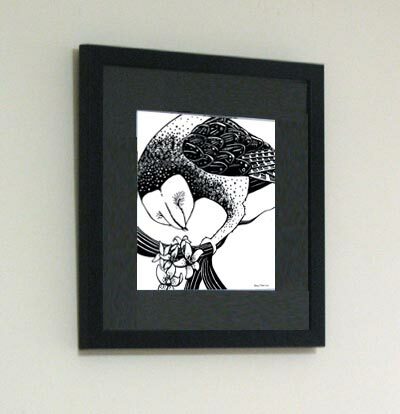 It has been a framing marathon around here… trying to get everything safely inside a frame is quite a job! 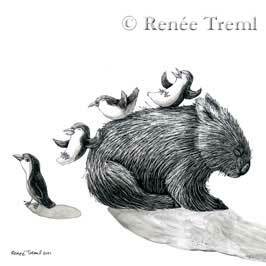 These three pieces are the first not-book-related illustrations I did following chemo. They are a little different from my usual, but I like them and I hope you do too. These pieces follow my favorite theme of relocation and habitat loss — where will our birds go when their are no more trees? In this case, the owls are treated as pretty ornaments on decorative orchids (although I don’t think the boobooks approve). I have finally dismantled the triptych Who Needs Trees? and framed them as three separate pieces. They made a lovely trio, but the frame was just enormous and way too heavy. 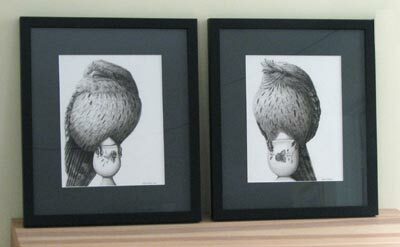 So, here they are in their shiny new Australian-made frames, ready to hang in an upcoming benefit exhibition for the RSPCA. The original triptych was awarded Highly Commended in the 2009 Caldera Art Awards and Who Needs Trees?2 was featured in the demonstration piece I wrote for Artists Palette Magazine two years ago. As usual, my photos do not do them justice, but I was in a rush to get them online before I hand them off to the exhibit organizer today. 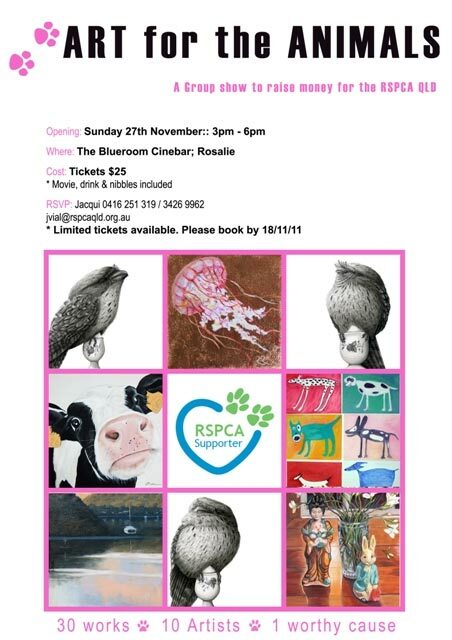 If you are interested in attending or want more info about the benefit exhibit, please contact Jacqui Vial at jvial@rspcaqld.org.au or 0416 251 319. 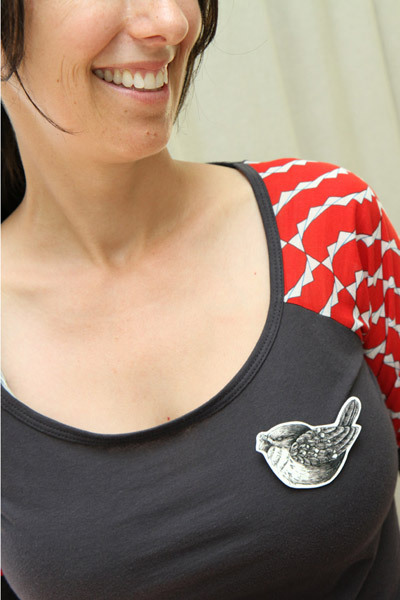 I finally caught up with my photographer-friend Bevan and we had a lot of fun taking new product shots for the brooches and necklaces. Of course, I did not think to coordinate another model, so I had to pose for all the shots! It was a little awkward at first, but fortunately, I have a stash of wigs from the chemo days and we both have a good sense of humor. My favorite serious shot wearing an awesome new top I picked up at Finders Keepers last weekend. 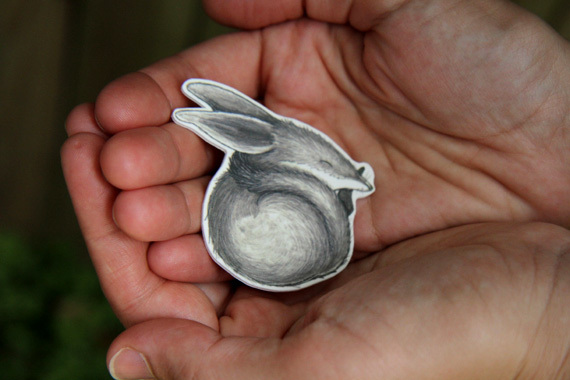 Bevan did a wonderful job capturing the delicacy of this sweet little brooch. If you want to see the other photos, click on over to my Etsy site and check out the brooches and necklaces. This has been a very exciting spring for new products. As promised, here are details about my new line of limited edition necklaces. These are available in three designs and only 50 will be made of each design. 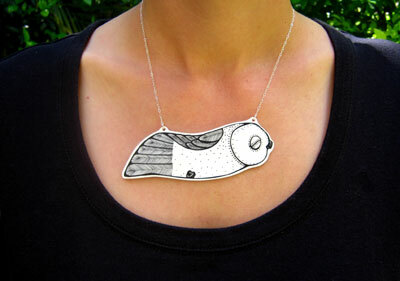 Each necklace is hand cut, signed and numbered by the artist and strung on a sterling silver chain. The pendant is plastic, so they are super lightweight and extremely durable. They are also slightly curved to lay smoothly on the chest. Although they are well-sealed with a UV and waterproof coating, I would not recommend wearing them swimming or bathing. 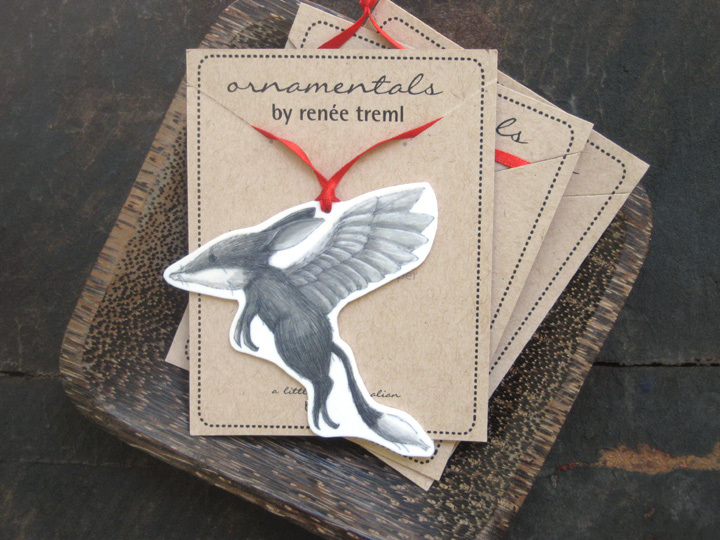 Each necklace is packaged on a recycled card stock. 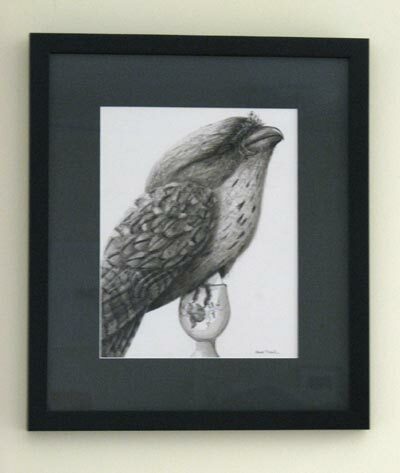 Big Owl measures approximately 100 x 35 mm, cardinal measures approximately 90 x 30 mm and small owl measures approximately 75 x 27 mm. These will be available online very soon (I just need some better photos!) and for wholesale (although these did not make it into the catalogue). 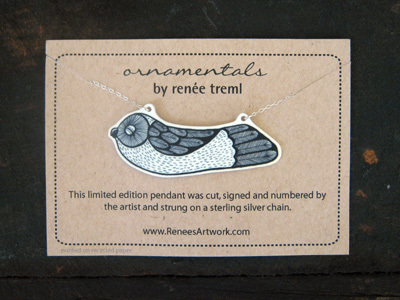 Please email me at ReneesArtwork[REMOVE]@gmail.com if you need details about how to get a necklace. 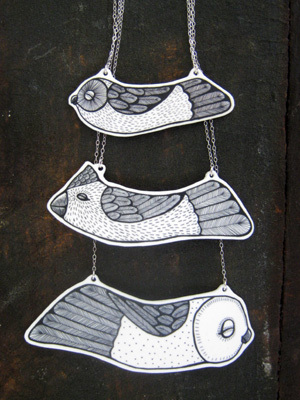 Just in time for the Finders Keepers Markets in Brisbane… new Bilby Angel Ornaments. The markets were lovely as usual and (surprise surprise) I have no photos from the day. So much amazing work to chose from and I was happily supporting other designers with my purchases. Check out the line-up of designers here. I was fortunate to visit with many repeat customers and meet some new ones and my lovely friend Cait was helping me both days. Oh right, back to the ornaments! These ornaments will be available online at my Etsy shop, at the upcoming BrisStyle Indie Design Markets (Dec 10) and Twillight Markets (Dec 16), and are available for wholesale (even though they did not make the catalogue). King George’s Square in CBD Brisbane is the place to be tonight (Friday 28 October) for the BrisStyle Twilight Markets! Markets open at 5pm and run until 9pm. With the holidays right around the corner (eek! ), you can shop from over 60 independent local artists, crafters and designers while listening to live music by the Brisbane Metropolitan Band. King George's Square all lit up for Twilight Markets! This is my first market after way too many months of breast cancer treatment and I am so excited to finally display my new necklace designs, as well as ornaments, brooches, stationary and new artwork. Can’t make it tonight? No worries — I will also be at the Finders Keepers Brisbane Markets at the Old Museum next weekend (Nov 5 & 6) and the BrisStyle Eco Markets on Saturday Nov 13 in Hamilton. Not in Brisbane? You can always visit the lovely stockists in your area or shop online (necklaces will be available online and in shops soon). If you are at any of the markets, please stop by and say “hi” and let me know what you think of the new designs! Just wanted to bring your attention to breast cancer awareness month and a fundraiser by BrisStyle artists for Chicks in Pink. Chicks in Pink is a charity organization that provides real support to breast cancer patients at the Mater Hospital in Brisbane. Several members of BrisStyle (Etsy Street Team) will be donating a portion of their sales during October to Chicks in Pink. You can read more about it and see some of the gorgeous works for sale on the BrisStyle Blog. I am proud to be participating in this fundraiser as a donating artist. While I was undergoing treatment earlier this year, I received amazing support from Chicks in Pink. This included house-cleaning, hospital parking vouchers on chemo days, and (best of all) they organized a wonderful mum’s group full of other young mum’s with breast cancer. I have been hard at work creating necklaces that feature some of my new designs. 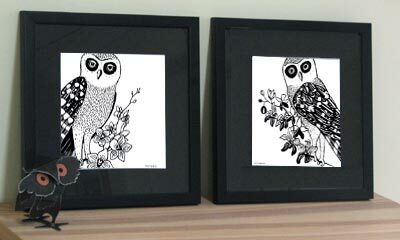 This image is a preview of the first design which features an owl (of course). 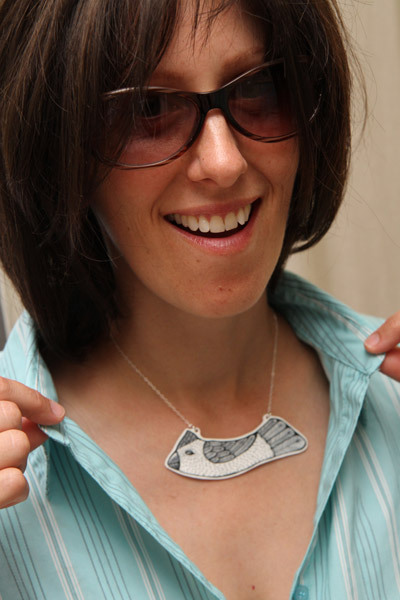 I have been test-driving the necklace this week and have just a few tweaks to make before I will consider it officially finished and market-ready. I hope to have at least 3 designs ready in time for the holiday season! 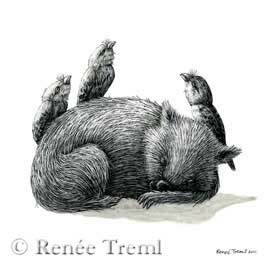 In honor of this lovely Friday, I have three new wombat images I would like to share with you. 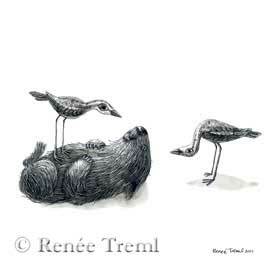 These were created for my picture book and feature a very tired wombat with 2 curious curlews, 3 furtive frogmouths and 4 playful penguins. I may have to create some versions with a splash of colour too. These images will be available at the upcoming Brisbane markets (more info on those coming soon), in the updated wholesale catalogue, and by special order on Etsy (just contact me for details). I hope you enjoy!